Look at the chart below and think about the activities you and your household typically access each day. 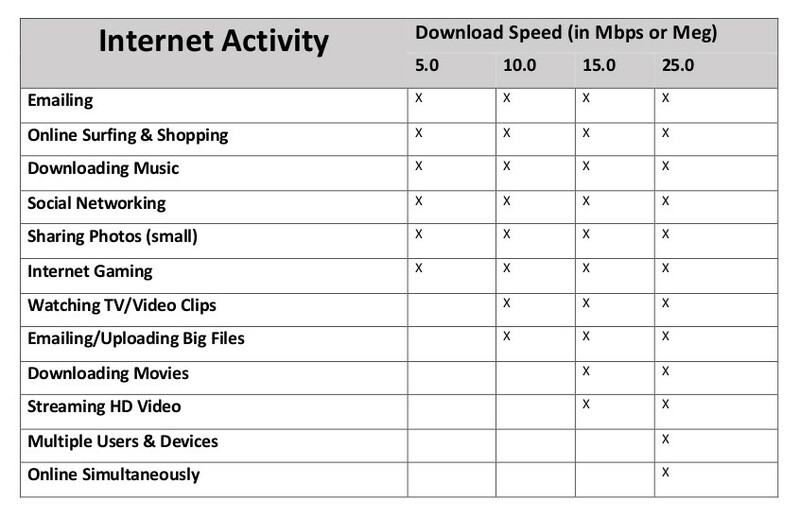 If most of the Internet activity involves watching videos, checking email, and otherwise collecting data and information from the web to your tablet or computer, you should be aware of your download requirements. The average US household has around 8 devices connected to the internet. This includes computers, tablets, smartphones, gaming systems, and video streaming boxes like Roku & Apple TV. Each uses a portion of the available Internet capacity in your home. Think of 5 Mbps (Meg) like a 5 lane freeway. If one person is watching Netflix, they are using at least 3 lanes of your Internet freeway, leaving only 2 lanes free for other users, functions, or devices. But if you have two devices streaming Netflix at the same time, 6 lanes of Internet freeway would be required. 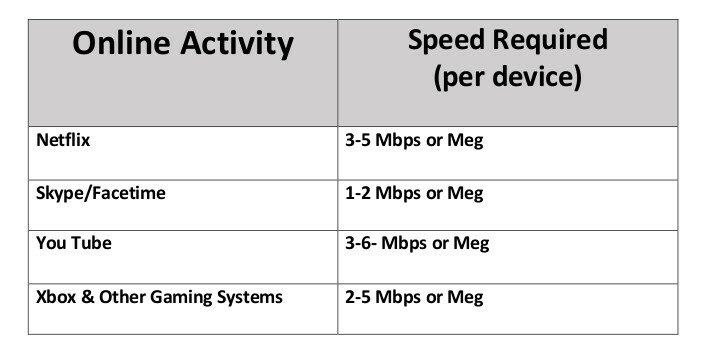 If you only subscribe to 5 Mbps (Meg), this means that one or more devices will have conflicts and congestion which ultimately slows the Internet speed for everyone on that connection. Keep the number of devices used simultaneously in mind when choosing your Internet speed.